It seems Charly Boy is looking for an avenue to unleash his anger after his attempt to protest Buhari’s prolonged absence met strong resistance at Wuse market in Abuja on Wednesday. The 66-year-old was almost beaten as his car was vandalised by supporters of President Buhari. He would have been lynched if not for the prompt intervention of police. On the night of the attack, Charly Boy took to the social media to challenge 2Baba for refusing to join his anti Buhari movement. “My guy 2face, I am not happy with you. Since I couldn’t reach you directly, I decided to reach you through this medium. Do you remember when you called on Nigerian youths to come out and protest? We obeyed because we thought you had a good intention to stand up to the injustices against the youths and masses of this country. But, as you retreated into a hole since then, I am very pained. If a beckon of hope like you can be lily-livered when people need you more, what is your problem? 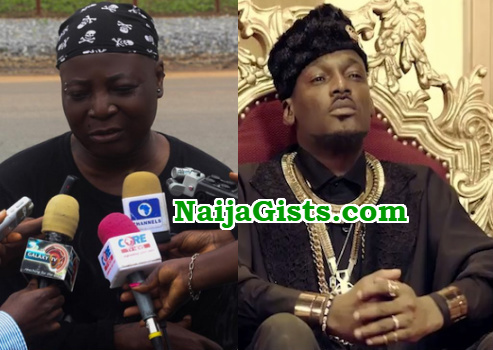 Charly Boy who is yet to get a response from 2baba also lamented the absence of his colleagues at the protest. Jim Iyke was among the celebrities who joined the protest on Monday but didn’t return. 2face Idibia Allegedly Collected Cash From Akpabio To Stage Protest, Singer On DSS Radar! Most of the celebrities are money mule to the politicians, so they don’t want to spoil their own business…they are enjoying it as it is,flying from Dubai,to London,then to America. Na by force? This is a matter of personal belief so nobody should try forcing another to join his own band wagon a beg! Thanks o, @Anita and @Big Aunty Toks. I do not think Charly Boy is less than 60 and he is doing the tomfoolery dance.May be Tubaba has decided to continue to use his music as a social crusade. Charly Boy has got much going on in the entertainment department, hence the need to get on top of the proverbial roof and holler for change –and of course relevance. I advise him to do the next parade in Buhari’s state and states near and let’s see what happens to this confused grandpa. Thanks o, @Anita and @Big Aunty Toks. I do not think Charly Boy is less than 60 and he is doing the tomfoolery dance.May be Tubaba has decided to continue to use his music as a social crusade. Charly Boy has not got much going on in the entertainment department, hence the need to get on top of the proverbial roof and holler for change –and of course relevance. I advise him to do the next parade in Buhari’s state and states near and let’s see what happens to this confused grandpa. To my own opinion. I think we youth should stop complaining about the government. We should try make a difference to our society like setting up charity organization that will feed people who are hungry, books for student, and all sorts of things. We can do these things through donations from we youths ourselves. I can clearly see you have a job, so just thank God and go to bed. it is a matter of self esteem,charley boy is not bold enough,and 2face is a popular figure and influencial.that is why they rely on him so much,then charley should know that any security or higher authority will always pie the pressure on who is leading the protest for peacetalking and consequence of everything,and as a figure and roll medel to many who will he want to die or stay alive considering how your own people could turn against you when the going get tough.it is a matter of the devil and the deep blue sea. Oga Charlie, if you had died in that place, theyn would have said, “he is survivedby children and grandchildren”, but Tuface on the other hand still get plenty pikins, wife and babymamas to feed. He no ready to die yet, so no vex for am! Him dey fear for him head. You know weather na him collect the ‘kpafo’wey them talk say them give na im make am vamoose. You don try jare, atleast we all see the result now. Congratulation to you and your people.